Maria Santoferraro (RYT 200) spent the past 25 years ravaging her body in the crazy corporate world. Needing a detox from an unhealthy Blackberry addiction, boatloads of stress, and an aching back, she sought out a healthier lifestyle and luckily found her physical and spiritual release through the practice of yoga. Back in her early forties, Maria started having trouble getting out of bed in the morning due to back pain brought on by scoliosis and stress. Deciding she was too young for that nonsense, she took the advice she’d been given about practicing yoga, did her first few downward dogs, and immediately knew it was the elixir she needed. Like most people, though, the daily grind of the corporate world kept her off the mat for extended periods of time. She took a deep dive back into the world of yoga four years ago, traded in her black power suits for black stretchy yoga pants, and has been riding the waves of an incredible yoga high ever since. If you had told Maria four years ago that she would now be teaching yoga, she would have thought you were crazy, but today she is living a balanced and blissful life, sharing yoga inspiration on the Daily Downward Dog (named a top yoga blog in 2012 by DoYouYoga), creating meditation videos for Hang 10 Meditation, providing brand management and social media engagement for several yoga brands. Her playful, heart-opening teaching combines meditation, breath, alignment, and asana in flowing Hatha yoga classes that encourage students to reconnect to their bodies and breath and to fill up with joy. Maria incorporates uplifting class themes, music, poetry, laughter, and the spiritual teachings of yoga to create a peaceful environment where students can quiet their minds, let go, and experience a deep sense of calm and well-being. 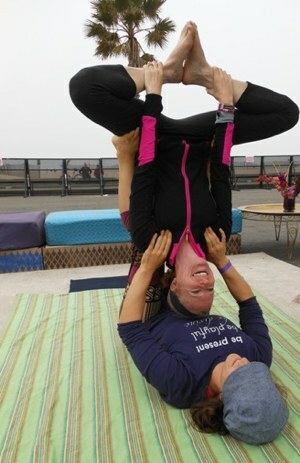 In 2011, she was able to combine two of her greatest passions – yoga and the beach – to start her own beach yoga “studio” on the beautiful shores of Lake Erie, Ohio, where she has shared yoga with hundreds of students. In 2013, she is adding her passion for travel and adventure to the mix with her first beach yoga retreat on the idyllic Caribbean white sand beaches of Aruba from April 6–13. This week of beach yoga bliss will include daily inspirational yoga and meditation classes led by Maria and the opportunity to bust out some yoga moves on a standup paddle board (SUP yoga). Favorite yoga style: Any style will do – as long as it’s done on a beach! Favorite yoga pose: Adho Mukha Svanasana (downward-facing dog) because it's just about the most famous and highly practiced yoga posture of all time, that's all! If they gave out Oscars for yoga, this pose would have won Best Asana. For me, it is the quintessential pose and one that inspires me each and every time I practice. When I'm in yoga class, that first downward dog is always tough. As the class continues, I push myself to get what I came for, my body warms up, and miraculously by the end of class, that downward dog feels oh so good as it stretches out my lower back, shoulders, arms, legs, and I'm getting those heels just a little closer to the floor every time… Aahh, I love yoga! Yoga is... How I keep my sanity, how I find my bliss, and ultimately if we all practiced the yamas and niyamas and meditated for a few minutes each day, the universe would be full of peace and joy. This thing I call a yoga victory. Each time I come to the mat I look forward to the opportunity to experience one. Maybe the victory is noticing that I’ve got my head a little closer to the ground in prasarita padottanasana (wide-legged forward fold), being able to meditate a few minutes longer, reaching that blissed out state I can get to when I allow myself to let go and be present, or finally achieving a pose like salamba sirsasana (supported headstand) for the first time. There is a sense of joy that comes with that accomplishment no matter how small or large. These victories don’t happen overnight; it takes years of practice and I’m addicted to all those small yoga victories and can’t imagine what my yoga journey would be like without them. I really try to emphasize this with new students that are anxious to get to the next level in their practice, to let them know that they have a lifetime to refine their practice and that each time they come to their mat they have the opportunity to grow both spiritually and physically. I could write a whole book on this topic because yoga has completely changed my life. Let’s see, I used to be a stressed out executive, and today I’m a blissed out yoga teacher. In terms of physique, I am two pant sizes smaller, a helluva a lot firmer, and standing a lot straighter. I’ve actually grown about a half inch due to all the stretching and twists of yoga. I always heard that women were supposed to shrink when they got older, so it’s nice to know that yoga is helping to reverse the aging process. My back pain has gone away, and other than going to the chiropractor for an occasional adjustment, yoga has made my back stronger and pain-free. Most of all, I just notice that I’m a happier person. I’m blessed to be doing work that I love and am passionate about. I smile more, I laugh more, I’m full of gratitude, and I’m content with what I have. The more yoga I do, the happier I get! It has taught me how to let go of my monkey mind and allow myself to be present in the moment. I used to always worry so much about what was going to happen next, or fester about my past, and the practice of yoga has taught me to do one thing at a time and savor each moment of life. I find that I’m more connected to those around me, a better listener, a better hugger, and way more compassionate. Well I have to say when you practice outdoors it is always challenging and interesting. Anyone can practice inside, but not everyone can practice with their feet in the sand or grass. The ground might be uneven, especially when you practice on sand, a bug might crawl across your mat, or an eagle might be soaring overhead, but that is what makes outdoor practice so rewarding. You get to go outside your normal routine, feel the sand beneath your feet, the sun on your face, and connect with nature. I’ve also been known to try different kinds of yoga to mix things up and provide a challenge, so in the last year I’ve tried Bikram, aerial, acro-yoga, and wall yoga. I love that there are so many different types of yoga, and I want to try them all. I’m also fortunate that I live in an area with a lot of great teachers so I’m always road tripping to different studios to learn from and practice with new people or attend workshops from visiting teachers like Rodney Yee, Erich Schiffmann, and Kathryn Budig. I think one of the most important things to remember as students of yoga is this simple fact – Yoga is a practice. You have the rest of your life to practice and grow in it. No need to beat yourself up if you can’t touch your toes or do a handstand. Instead, repeat this mantra: How cool is it that there’s still so much to learn about yoga? I have the rest of my life to go on this amazing yoga journey. I highly recommend the documentary YOGAWOMAN. Talk about inspiration; this movie is like a Superbowl for yogini goddesses. As I watched one story after another, I gathered wisdom from some of yoga’s most incredible female role models – Patricia Walden, Sean Corn, Tari Prinster, Donna Farhi, Cyndi Lee, Angela Farmer, and Judith Lasater were just a few in the all-star line-up. If you are a woman and have always wanted to know what is so special about yoga, this movie brilliantly illustrates all of the benefits that a yoga practice can bring. My favorite part of the movie was learning about the early female pioneers who doggedly pursued the practice despite the fact that, in most parts of the world, yoga was reserved only for men. Women like Indra Devi, Lilias Folan, and Geeta Iyengar, who dedicated their lives to yoga and brought the practice to women around the world, are my role models. I'm especially intrigued and am studying about the goddesses like Lakshmi, the goddess of prosperity (both material and spiritual), generosity, and courage, and Tara, the goddess of compassion. I’m weaving their stories and inspiration into the classes I’ll be teaching on my Aruba yoga retreat. The sounds of waves, wind, and birds chirping make up my favorite soundtrack while practicing yoga. I’m not a fan of the harpy, Zen-like genre of yoga music. I like to include upbeat music in my class playlists. Sometimes that means a song has a little soul or maybe even a little rap (thank you, MC Yogi), and I always include a little reggae. Right now my favorite artists are Donna De Lory, C.C. White, DJ Drez, Girish, MC Yogi, Trevor Hall, and Michael Franti. Take one day at a time – this is enough. Do not look back and grieve over the past for it is gone; do not be troubled about the future for it has not yet come. Live in the present, and make it so beautiful it will be worth remembering. Or, in other words, life is short, live today like there’s no tomorrow! My father died at a really young age, so I took this advice to heart. I’m also really grateful for all the people who told me to marry my husband (they were right) and who encouraged me to become a yoga teacher when I thought I was too old and inflexible. I sometimes call myself the poster girl for setting intentions. I’ve set a lot of them over the last few years and allowed myself to believe in them, and many of them have come true. So keep dreaming and believing in those dreams. The universe really does want to love and support you. Just remember to practice caution because when you direct your mind and heart in a new direction, it can be very powerful!